For Holocaust Memorial Day, we are releasing a short film in collaboration with Big Grange Local, Barnet Multi-faith Forum, and the residents of East Finchley. 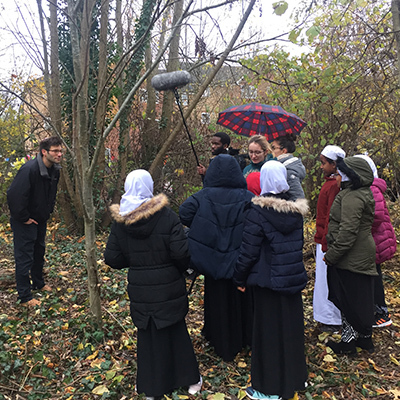 BA Film students from Middlesex recently produced the short film about a community bulb planting day, as part of a Barnet Council initiative to remember every one of the 1.5 million children who died in the Holocaust. The event brought together people from multiple different faiths to plant a memorial garden dedicated to those who have lost their lives as a result of religious persecution. The film features Amina Qadi, a young woman from the Somali Bravenese community who has been very active in multi-faith dialogue in the area around East Finchley. In 2013, the Somali Bravenese community centre was burnt down, an act of hate crime. The local Jewish community responded by inviting them to pray at the local synagogue. In an act of solidarity, Amina dedicates the bulb planting to the 11 people who lost their lives in the shooting at a synagogue in Pittsburgh on 27th October 2018. This film captures the positivity and resolve when people come together. 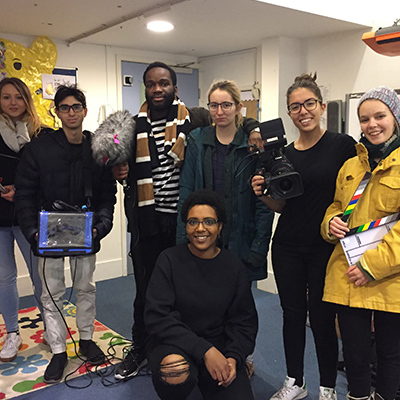 The film was shot by third year BA Film students, who went to Tarling Road in East Finchley in late November 2018 to film the community bulb planning event. This is the latest project in a wider body of work led by Director of Student Affairs David Malpas, with Ben Serlin (Senior Programme Manager, Student Affairs) and Helen Bendon (Director of Programmes for Cinema and Interactive Arts) for ‘The Changing the Culture Initiative’ at Middlesex University, our long-term commitment to addressing violence against women, harassment and hate crime. Cinematographer and editor Bruna Ventura got involved in this project "because I wanted not just to be part of thee whole process of doing this documentary, but also to experience and live this day as a community, where everyone is welcome." The work we have done so far includes a “No Home for Hate” initiative foregrounding students’ voices in looking at hate crime, and the development of sector-specific training to enable all staff to be able to recognise, respond and report safeguarding concerns. We are also developing this activity to involve local community engagement whereby students engage with individuals and groups affected by hate crime, help communicate their stories and challenge behaviours and attitudes. This latest film demonstrates our commitment to working together as part of #TeamMDX to drive forward culture change.